Technology has brought us so much: the moon landing, the Internet, the ability to sequence the human genome. But it also taps into a lot of our deepest fears, and about 30 years ago, the culture critic Neil Postman wrote a book called "Amusing Ourselves to Death," which lays this out really brilliantly, comparing the dystopian visions of George Orwell and Aldous Huxley. He said, Orwell feared we would become a captive culture. Huxley feared we would become a trivial culture. 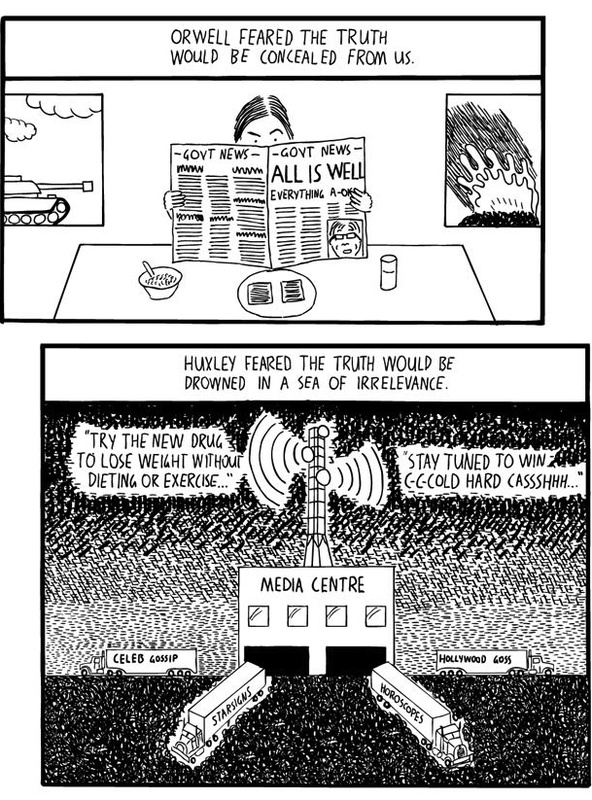 Orwell feared the truth would be concealed from us, and Huxley feared we would be drowned in a sea of irrelevance. In a nutshell, it's a choice between Big Brother watching you and you watching Big Brother. But it doesn't have to be this way. We are not passive consumers of data and technology. We shape the role it plays in our lives and the way we make meaning from it, but to do that, we have to pay as much attention to how we think as how we code. We have to ask questions, and hard questions, to move past counting things to understanding them. We're constantly bombarded with stories about how much data there is in the world, but when it comes to big data and the challenges of interpreting it, size isn't everything. There's also the speed at which it moves, and the many varieties of data types. What unites this disparate types of data is that they're created by people and they require context. It's not just big data that causes challenges of interpretation, because let's face it, we human beings have a very rich history of taking any amount of data, no matter how small, and screwing it up. Many years ago, you may remember that former President Ronald Reagan was very criticized for making a statement that facts are stupid things. And it was a slip of the tongue, let's be fair. He actually meant to quote John Adams' defense of British soldiers in the Boston Massacre trials that facts are stubborn things. But I actually think there's a bit of accidental wisdom in what he said, because facts are stubborn things, but sometimes they're stupid, too. Facts are stupid things. And they're vulnerable to misuse, willful or otherwise. I have a friend, Emily Willingham, who's a scientist, and she wrote a piece for Forbes not long ago entitled "The 10 Weirdest Things Ever Linked to Autism." It's quite a list. The Internet, blamed for everything, right? And of course mothers... there's a whole bunch in the "mother" category here. And you can see it's a pretty rich and interesting list. I'm a big fan of being pregnant near freeways, personally. The final one is interesting, because the term "refrigerator mother" was actually the original hypothesis for the cause of autism, and that meant somebody who was cold and unloving. And at this point, you might be thinking, "Okay, Susan, we get it, you can take data, you can make it mean anything." And this is true, it's absolutely true, but the challenge is that we have this opportunity to try to make meaning out of it ourselves, because frankly, data doesn't create meaning. We do. So as businesspeople, as consumers, as patients, as citizens, we have a responsibility, I think, to spend more time focusing on our critical thinking skills. Because at this point in our history, as we've heard many times over, we can process exabytes of data at lightning speed, and we have the potential to make bad decisions far more quickly, efficiently, and with far greater impact than we did in the past. Great, right? And so what we need to do instead is spend a little bit more time on things like the humanities and sociology, and the social sciences, rhetoric, philosophy, ethics, because they give us context that is so important for big data, and because they help us become better critical thinkers. Because after all, if I can spot a problem in an argument, it doesn't much matter whether it's expressed in words or in numbers. And this means teaching ourselves to find those confirmation biases and false correlations. Did the data really show us this, or does the result make us feel more successful and more comfortable? If we are to unlock the power of data, we don't have to go blindly into Orwell's vision of a totalitarian future, or Huxley's vision of a trivial one, or some horrible cocktail of both. What we have to do is treat critical thinking with respect and, as they say in the superhero movies, let's use our powers for good. Susan Etlinger is an industry analyst with Altimeter Group, where she focuses on data and analytics. She conducts independent research and has authored two intriguing reports: “The Social Media ROI Cookbook” and “A Framework for Social Analytics.” She also advises global clients on how to work measurement into their organizational structure and how to extract insights from the social web which can lead to tangible actions.